By Rachel Held Evans, on September 07, 2012. In a rare unscripted moment at the Democratic National Convention this week, Los Angeles Mayor Antonio Villaraigosa called for a voice vote to pass an amendment to the party platform reinstating language that identified Jerusalem as the rightful capital of Israel and that referred to people’s “God-given potential” in its preamble. Though reinstating the language was supported by many democrats, including President Obama, not everyone on the floor agreed that it was useful or necessary, and so when Villaraigosa declared that the “ayes” had the necessary two-thirds majority, the room erupted into boos from dissenters. And so we end up with video footage of a room full of liberals “booing God and Jerusalem”—otherwise known as “Christmas” at Fox News. Blog posts were written. Tweets were issued. E-cards were pinned. Now, I’m a Christian, who loves Jesus and who hopes to honor God with my life, but frankly, after hearing about 100 “God bless Americas” shouted between the two conventions, and dozens of biblical references dropped by both parties, I was just fine with seeing God’s name removed from yet another piece of political propaganda. Because God is not a flag pin. God’s name is not something to use to score political points. It's not something to throw around lightly or to use as a weapon against a political opponent. As Christians, we need not be threatened by alterations to the wording of a political platform because we don’t measure Kingdom growth by where we find God’s name, but by where we find God’s presence. And no political party has a monopoly on that. 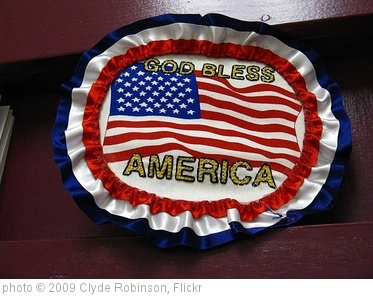 There seems to be a misconception among many American Christians that fighting the good fight of faith means keeping God’s name on our money, in our speeches, in our pledge, and on our bumper stickers.But this is the danger of civic religion: it convinces us that God’s name is the same as God’s presence; it convinces us that we’ve “won” when we hear the right words, regardless of whether we’ve seen the right fruit. Ironically, we render God’s name more meaningless each time we use it carelessly to advance our own agendas. Ironically, we lose when we count each forced “God bless America” as a win. When Jesus was asked about taxes, he didn’t hold up a coin, point to it dramatically, and shout to the crowd, “WHY ISN’T MY NAME ON THIS?! I NEED YOU GUYS TO GET MY NAME AND PICTURE ON THIS THING—STAT!” (...or whatever the Aramaic equivalent of “STAT” would have been). War, division, power, and greed—these things are Caesar’s. Love, joy, peace, patience, kindness, goodness, faithfulness, gentleness, and self-control—these things are God’s. Against such things, there is no law; and for such things, there is no single earthly political platform. So how have you responded to the religious overtones at each convention? What has encouraged you? What has discouraged you?